The Algiers Point Historic District, bounded by the curve of the Mississippi River on two sides, and by Atlantic and Newton Streets on the other two, was initially granted to Jean- Baptiste Lemoyne, Sieur de Bienville, founder of New Orleans, in 1719. The district encompasses land that was originally laid out as the town of Algiers around 1840. 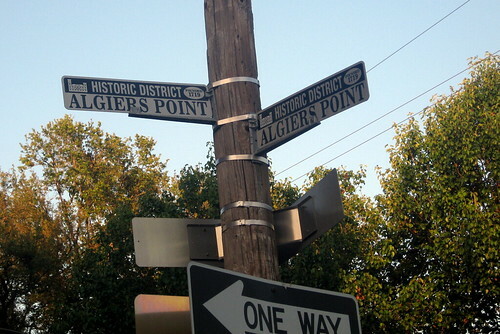 Historically, the navigational name for this bend in the river was Algiers Point, and so the town took its name. The Algiers-Canal Street Ferry began in 1827 and has been in continuous operation ever since. In 1837 a dry dock, said to be the first on the Gulf Coast, was established at the foot of present-day Seguin Street. By the 1850s, Algiers had two suburbs, Belleville and Brooklyn, which would later be absorbed into the growing town. Also in the 1850s, the New Orleans, Opelousas and Great Western Railroad was built through Algiers. The railroad yard grew and flourished in the Elmira-Pacific-Atlantic area, exerting great influence there and eventually employing three to four thousand Algiers residents. The town of Algiers was annexed by the City of New Orleans on March 14, 1870, and it continued to develop into the early twentieth century. Some of the antebellum structures still exist today, but the district is dominated by buildings in the Greek Revival, Italianate and Victorian styles, reflecting Algiers Point's period of growth and development in the second half of the 19th century. The majority of the buildings are single story, although story and a half, camelback, and two-story homes are found. Dwellings range from modest to grand. Virtually all residential structures are of frame construction. Because the majority of homes were intended to be owner-occupied, construction is finer and decorative trim more elaborate.